The results of over a year of collaborative effort between the Sauk River Chain of Lakes, Inc. as well as representatives from eight local units of government and resource agencies were resently presented during a public meeting held in Richmond. 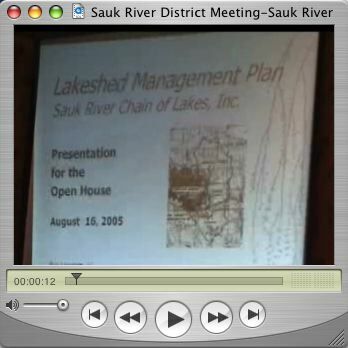 Jim Egan, a key leader in the efforts, gives a concise 3 minute version of the Lakeshed Management Plan. It was developed to help guide the long-term improvement and management of the watersheds that affect the Sauk Chain of Lakes. The plan is done, now is the time for action. Volunteers are needed to help implement the Lakeshed action plan.